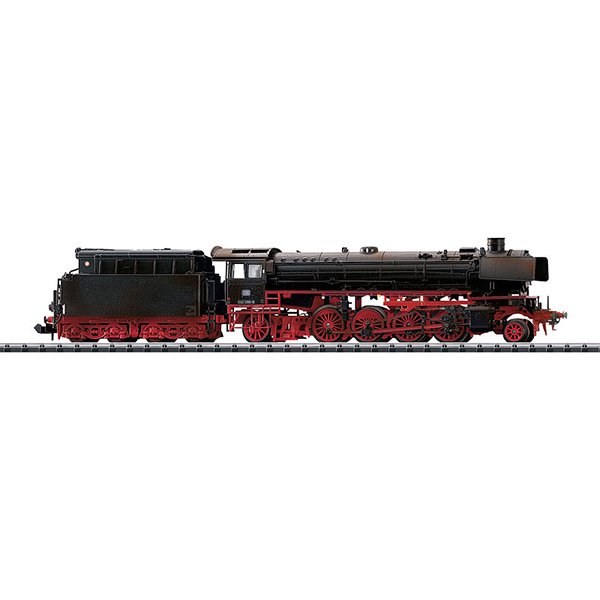 Prototype: German Federal Railroad (DB) steam freight locomotive, road number 042 096-8, with a tender and oil firing. Converted version with a new design high-performance boiler, Witte smoke deflectors, and converted tender with an oil bunker. The locomotive looks as it did around 1972. Model: The tender is constructed of die-cast metal. The locomotive has a built-in digital decoder and a sound generator with the formats DCC, Selectrix, and Selectrix 2. The locomotive and the tender are close coupled. 3 axles in the tender powered. Traction tires. The firebox has flickering light by means of processor-controlled LEDs (red-orange). Warm white LEDs are used for the triple headlights, cab lighting, and running gear lights. Length over the buffers 150 mm / 5-7/8". Highlights: Running gear lights. Processor-controlled firebox has flickering light. Cab lighting. Digital sound with many functions. World War II had been survived and the DB like the DR got back into business in the postwar period with over 300 class 41 locomotives. Since both state railroads could not do without the class 41, numerous units were equipped with new boilers. The DB developed a completely welded high-performance boiler with a combustion chamber as a replacement for the worn out St47K boiler. Compared to the previous long tube boiler, this one had a larger proportion of high-grade radiant heating surface and could therefore tolerate a higher load. Between 1957 and 1961, 102 class 41 locomotives were equipped with this new boiler at the maintenance facility in Braunschweig. This along with the removal of the front skirting changed the look of these locomotives significantly. Forty of these converted locomotives were also converted to oil firing. The units that were not converted were largely retired in the Sixties. By 1971, the grate-fired converted units followed; they were designated as the class 041 starting in 1968. The oil-fired class 41 units (starting in 1968: 042) were by contrast in use until the end of steam motive power on the DB in 1977 in the Rheine District. At least 13 oil-fired units remained preserved, however none of the coal-fired locomotives with or without a new design boiler. Currently, road numbers 41 018 (Augsburg), 096 (Klein Mahner), and 360 (Oberhausen) are operational.